Clump #29: Take down the ironing board as a permanent fixture. Quite a while ago, here, I set the goal of clearing out my bedroom as a statement of self-worth. Historically, I’ve given cleaning priority to public areas that guests might see (anyone from dear friends to unknown repairmen). Meanwhile, I neglect the rooms where I and my husband, dearest person of all, spend the most time. A force of instinct, not intention, but up-side down, indeed. Time to align intention with action. 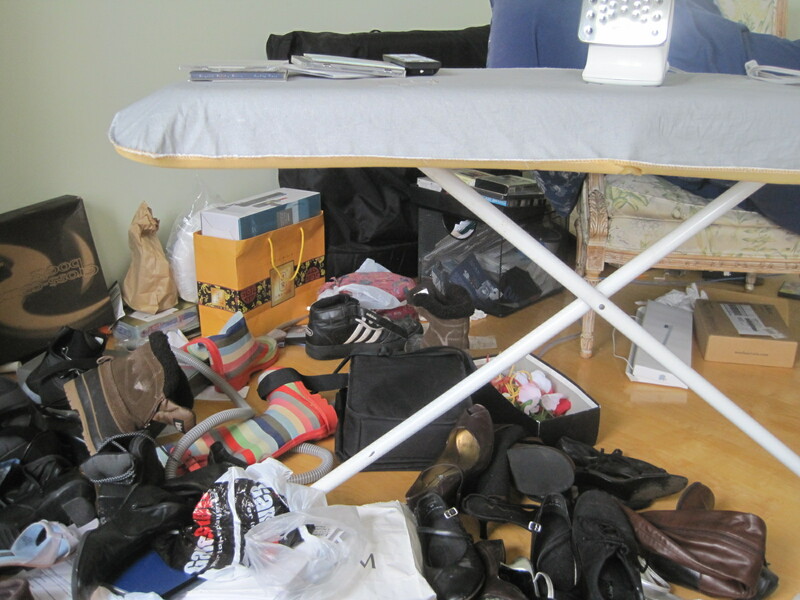 Through previous clumping, most of the room is staying clear, and with less clutter it’s easier to keep clean. (…Remarkable.) However, we have an ironing board in our bedroom that never, ever gets Put Away. Let me rephrase that: I never, ever Put it Away. This might not seem like a big deal, but it has now become our own Berlin Wall separating East and West Germany. * On one side is my newly-clear Zen space; on the other is the flotsam and jetsam of a previous, unresolved clearing-of-public-area-of-the-house effort. Lots of shoes and boots and other dreadful, stubborn stuff. More like a toxic oil spill! Keeping the ironing board out is also a subliminal message saying I am never finished with ironing. Yes, when rushing to get something pressed, it’s a lot easier to have the board right at hand, but the psychic toll is too high. Putting the ironing board away declares a clear and definite end-of-task. Wow … I can’t believe I’m posting this photo to the world. The shame!! 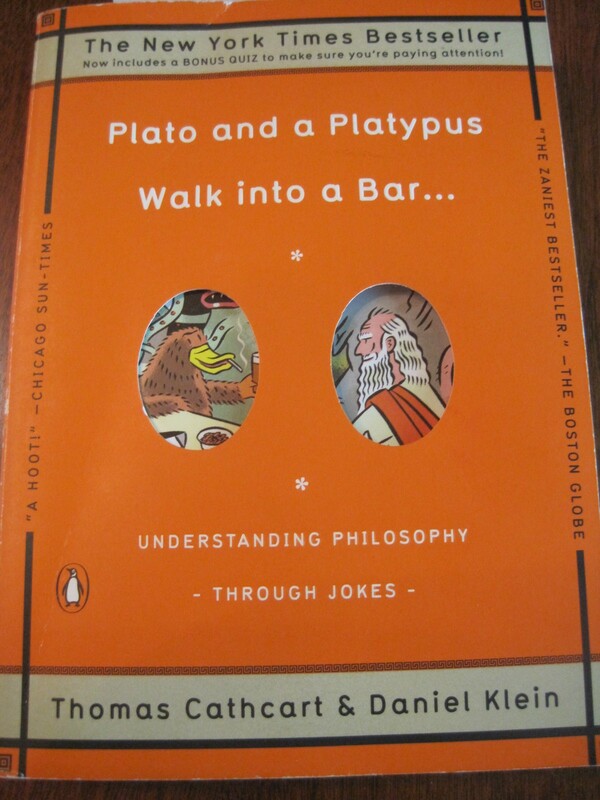 My husband and I were on a plane recently and he was reading the book, Plato and a Platypus Walk into a Bar … Understanding Philosophy Through Jokes, by Thomas Cathcart and Daniel Klein. His shoulders were shaking from laughing silently, so he handed over the following story for me to read. “On a transatlantic flight, a plane passes through a severe storm. The turbulence is awful, and things go from bad to worse when one wing is struck by lightening. For a moment there is silence. Everyone has forgotten his own peril, and they all stare, riveted, at the desperate woman in the front of the plane. Then a man steps up in the rear. He’s a tall, tanned hunk with jet-black hair, and he starts to walk slowly up the aisle, unbuttoning his shirt. ‘I can make you feel like a woman,’ he says. Here’s another book, courtesy of my husband, who spotted it in a book store. (I must note, he did not purchase it.) 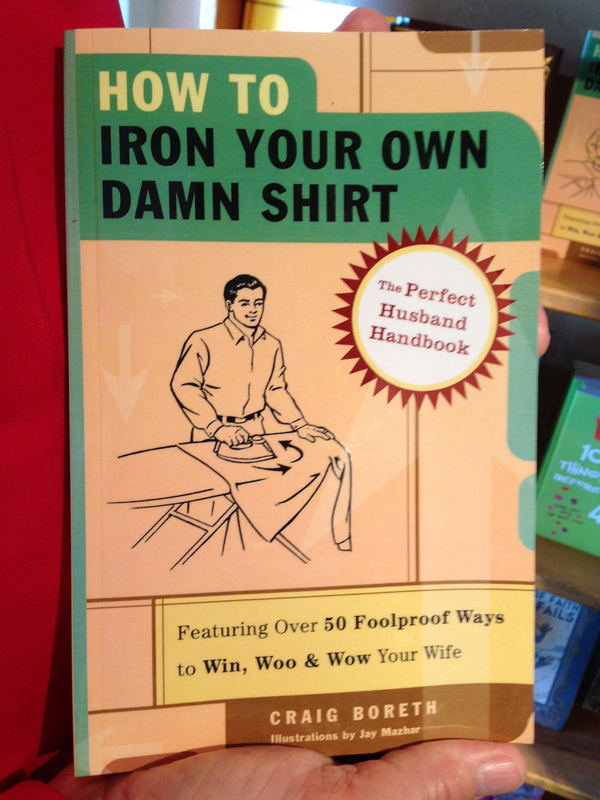 Further proof of the coming extinction of ironing as a woman’s domaine. Also of my feeling like a dinosaur (see above; even Barney has a more evolved view). *In the time I’ve been writing this post, I saw a film clip of Ronald Reagan’s famous “Mr. Gorbachev, tear down this wall” speech while visiting The–wonderful–National Constitution Center in Philadelphia. Then, on June 12, I happened to hear on the radio that it was the 26th anniversary of the speech. 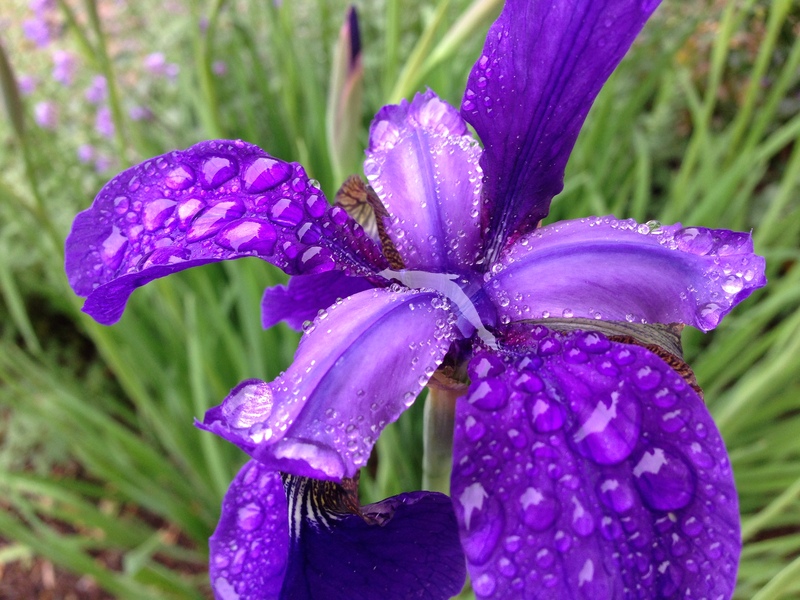 Phew … synchronicity strikes again!